The species Xanthorrhoea australis is commonly called the The Austral Grass Tree or Souther Grass Tree an it is probably the most widely found of all of the grass trees. With the common nickname of Black Boy plant, this is derived from the black trunks, usually as a result of fires, sometimes lit to clear land and other time bushfires. Also known as Balga grass, it is found as an under story plant in Victoria, New South Wales and Tasmania. Very popular as a landscaping plant Xanthorrhoea australis has a number of desirable features for this application. Frost tolerant, able to cope with poor soils, grows well in full sun to part shade and requiring little fertilizer and water once established. These are an evergreen plant, slow growing at around 2cm a year depending on conditions. The slow growing nature means that mature specimens tend to come at a high cost. 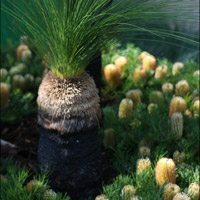 In many landscaping situations The Southern Grass Tree is planted as a specimen in a planter, we often see relatively young plants used as low growing features, taller specimens are available at a cost. How high will these plants grow, 3m on maturity is not unusual, but that might take 100 years or so. A well drained position is essential, Xanthorrhoea australis does not cope with water logged soils. Use of fertilizers with high levels of phosphate is a problem, these plants do best in a native garden where the level of phosphorous is not raised. Disease seems to be limited to root rot (Phytophthora cinnamomi). When purchasing larger specimens look for plants with a large root ball, usually balled and burlaped, larger plants that have had roots trimmed to fit into a pot for display in a nursery often do not survive the transplant. Seed pods can be collected when ripe and should be allowed to dry, seeds are then removed from the pod and can be germinated in a free draining potting soil, a little course sand over the top of the seeds will keep them in contact with the potting mix. Keep moist, but do not over water. All grass trees or Xanthorrhoea species are a slow growing plant and are usually very hardy and long lived. All Grass Trees require a well drained position and a sunny aspect. The tall woody flower spikes are a spectacular feature. Grass Trees may be grown in pots or planters. Xanthorrhoea australis is a protected species and harvesting is strictly regulated. Without a proper understanding of transplanting techniques most plants harvested from the wild will survive for only around three years. The root system of these plants is shallow but intense and often far to much of the original root system is removed or damaged. With a wide distribution, they are found in coastal heaths, wet and dry forests in many areas of Australia. Some species such as Xanthorrhoea australis or the ‘Austral Grass Tree’ and others will grow trunks, however other species such as Xanthorrhr oea minor or ‘Small Grass Tree’ do not actually grow a trunks at all and are found in the southern parts of Victoria and South Australia. Xanthorrhoea thorntonii The ‘Cundeelee Blackboy’ .